Sandy Koufax's pitching performance between the 1961 and 1966 seasons made him arguably the greatest pitcher of that era in baseball and he helped the Brooklyn/Los Angeles Dodgers win four World Series titles over his 12-year career. As a player so revered, Sandy Koufax baseball card appearances are still some of most sought-after today and this top list documents some of the best options. Shop for Professionally Graded Sandy Koufax Cards on eBay. Despite getting off to a slow start during his first few seasons, Koufax ended up recording an impressive .655 winning percentage over his career and an equally impressive 2.76 ERA. Koufax won three Cy Young Awards — 1963, 1965, and 1966 — and the fact that it was only awarded to one overall player at the time, as opposed to individual league awards now, makes it all the more impressive. He was the first pitcher to earn three Cy Young Awards and, amazingly, he also recorded the pitching Triple Crown in each of those three seasons. Shockingly, after his strong 1966 season, Koufax retired due to arthritis which had developed in his pitching elbow. Koufax's career, although cut short by injury, still set some impressive records. He was the first pitcher to record four no-hitters and the only Dodger pitcher to ever throw a perfect game. He is also one of only four pitchers to record more strikeouts than innings pitched for their career. In 1972, he became the youngest player elected to the Baseball Hall of Fame at the age of 36. Each year from 1961 to 1967, Koufax was featured on at least one National League pitching leaders card in every Topps set. Some of these cards combined several future Hall of Fame pitchers together on a single card, with the high-water mark being his 1967 Topps pitching leaders card that included Juan Marichal, Bob Gibson, and Gaylord Perry. One of the few non-Topps Koufax appearances can be found in the 1963 Fleer set. 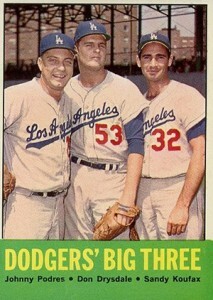 It is one of the more budget-friendly cards from Koufax's playing days. 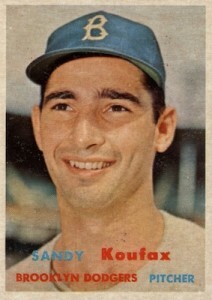 Sandy also was included in the 1962 and 1963 Post cards that could be clipped out of cereal boxes. For a complete gallery of the main cards issued during his playing career, view our Sandy Koufax Vintage Baseball Card Timeline. 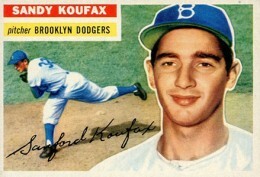 Koufax's limited number of baseball cards are second only to Mickey Mantle in terms of popularity and value. As such, nearly every entry below showcases cards from some of the most iconic post-World War II sets ever made. In creating the list, value is the main determining factor along with the card's design and popularity. You can find several combos among Sandy Koufax baseball cards, including "Dodgers's Big Three" from 1963 Topps that features his teammates Johnny Podres and Don Drysdale. Koufax also shares a 1961 Topps card with Podres titled "Dodgers Southpaws" and a 1965 Topps National League ERA leaders card with Drysdale. One of the rarest Koufax cards can be found in a set made by Topps for the Venezuelan market in 1967. Topps created three different sets to be distributed in Venezuela and, as Koufax had retired after the 1966 season, he was included in the 50-card set featuring former stars from the 20th century. These cards were produced on paper that was a lower quality than their American counterparts and are notoriously difficult to find in pristine condition even when they do surface. 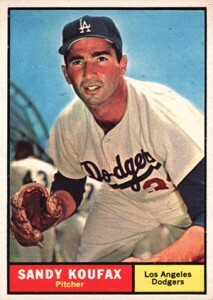 The 1961 season was Koufax's first as an ace pitcher and it saw him post an 18-13 record. His 1962 Topps card reflects his new status as an elite pitcher by highlighting on the card's reverse that he set the National League season strikeout record during the season with 269 Ks. The previous record had been held by Christy Mathewson since 1903. 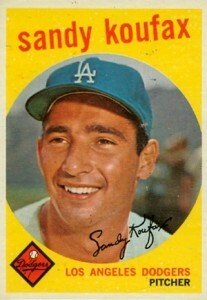 The 1961 Topps Sandy Koufax card features his first non-portrait photograph from Topps. Although he had the worst overall season of his career in the win-loss column, going 8-13, he was still able to make a name for himself by being second in strikeouts in the National League with 197. 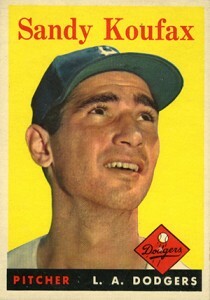 My personal favorite Koufax card is found in 1959 Topps with its bright yellow background. 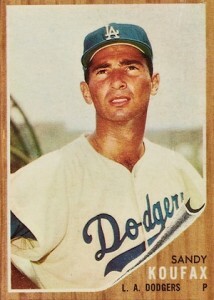 Because Koufax's photo is positioned slightly off-center, it can sometimes trick the eye into thinking the entire card is off-center. The 1959 set was Topps' largest to that point at 572 cards. The back of the 1958 Topps release for Sandy Koufax reminds us that he was termed a "bonus baby" when he began his career. The rule stated that players receiving a contract bonus of over $4,000 would have to be on the 40-man roster of the team for two seasons. When Koufax signed his contract, the player the Dodgers removed from the roster was their future Hall of Fame manager Tommy Lasorda. Topps debuted full-color photography in 1957 Topps, four years after the ground-breaking Bowman's 1953 set. 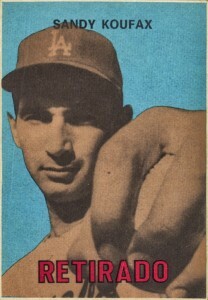 Koufax has a portrait card in the '57 product and it would prove to be the first of three consecutive Topps sets that would feature close-up photography for Koufax. The reverse side reminds us that he was born in Brooklyn and so it seems Sandy Koufax was destined to pitch for the Dodgers. Although you can find Koufax autographs in recent sets like 2016 Topps and 2015 Topps Heritage, for many years his signature was rarely included in modern trading card sets. Compounding that issue for collectors, Koufax is a notoriously difficult in-person or through-the-mail signer as he is a very private person. 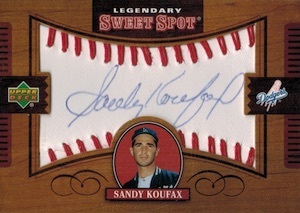 One of many autographed choices, 2002 Upper Deck Sweet Spot offers collectors the rare chance to have a portion of a signed Koufax baseball and trading card combined into one. During the years that Topps produced horizontal cards — the 1955 and 1956 sets — they frequently used duplicate images if a player was found in both. 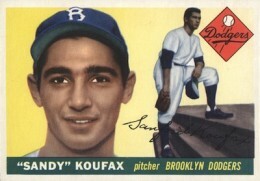 Koufax, however, receives original images for each release. Sandy's early days with the Dodgers weren't that great as he had a 28-27 record over his first five seasons in the majors. Because of this, few collectors knew the importance that his early trading card appearances would eventually hold. The Sandy Koufax rookie card in 1955 Topps is a hobby icon and only bested by Roberto Clemente's rookie from the set. Near-mint graded copies can top $4,000 and a rare near-mint/mint copies can triple that value, making it one of the most valuable and in-demand cards from the 1950s that doesn't feature Mickey Mantle. Great article Matt. There are some beauties on here. Although I am not a huge fan of oversized cards, I have always wanted to get my hands on a ’64 Topps Giants Koufax in a high grade. Hard to believe there are only 5 PSA 9’s in the pop report (and 3 10’s).